EgyptAir Flight MS804 has disappeared from radar during a flight from Paris to the Egyptian capital of Cairo, the airline says. At least 69 people were on board. From the FlightAware page, looks like the plane was last seen on the ADS-B data at about 0030Z cruising at FL370. That seems to be in agreement with the Flightradar24 screen capture posted above. The two networks get data from different ADS-B receivers as far as I know. FlightRadar 24 shows the aircraft is SU-GCC, an A320-232. Flightaware shows the aircraft is a B737-800. Searching on tail SU-GCC in Flightaware brings up the missing flight MSR804. Strangely it still shows up as a 737-800 for that flight. Website glitch or wrong type filed? It appears that the actual missing plane is an A320. Not sure why it shows up as a B737 in Flightaware. The same flight for the last two weeks on Flightaware also shows as 737. Last edited by Feathered; 19th May 2016 at 04:04.
does this mean descent below the level covered by radar between two pings? that seems very fast to me. ADS-B coverage in that area seems to be good. The last positions on the FlightAware log are from a station near LTFG airport in Turkey. I'm pretty sure they would show a descent before dropping below ADS-B range from looking at other lower traffic in that area. Looks to me like something happened fast. Antiquated idea of how "radar" works these days. What controllers see on their screens is a transmission from the aircraft (transponder, or as Airbubba says, now ADS-B). A flip of an on/off switch in the cockpit can make a plane "disappear" instantaneously. As can anything that cuts off the transmission: loss of electrical power, loss of airframe continuity. The aircraft does not have to "descend below radar coverage." The old-school, bouncing radio waves off aluminum, primary radar is available if desired, but if the aircraft is now a descending shower of confetti, won't help much after the fact. It will take some time to check the primary returns on tape to see what shows up there. All we really know right now is that the aircraft abruptly ceased transmitting while still at 37000 feet. A report on CNN gives the crew as two pilots, five flight attendants and three security officers. Some airlines from the Middle East have discreetly flown into airports like CDG and LHR for decades now with armed sky marshals. EgyptAir said that one of its aircraft disappeared early Thursday while flying from Paris to Cairo with 66 people aboard. 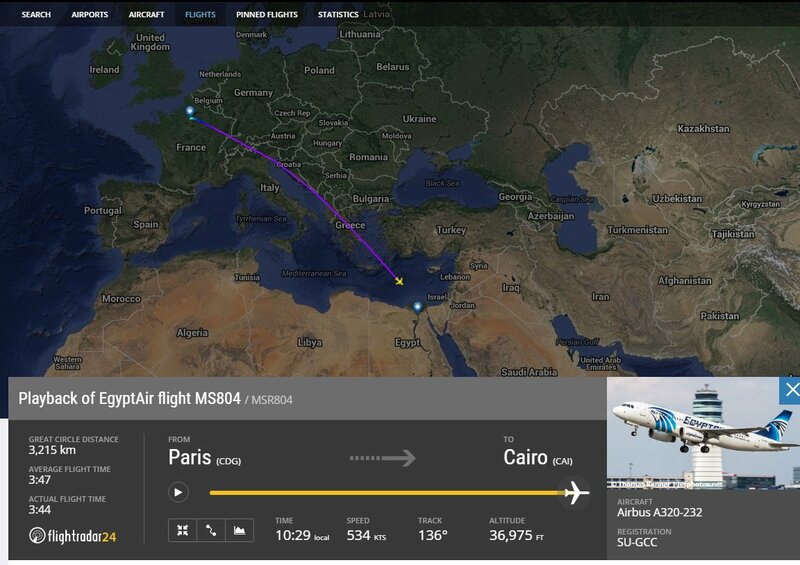 The Egyptian flag carrier said Flight MS804, which departed Paris at 11:09 p.m. local time, “disappeared from radar” at 2:45 a.m. Cairo time Thursday while at 37,000 feet, according to tweets on the airline’s verified Twitter account. The Airbus A320 with 56 passengers, three security personnel and seven crew was last spotted over the Mediterranean Sea en route to Cairo, according to flight-tracking websites. The airline said that a search and rescue operation was under way. The jet disappeared 10 miles inside Egyptian airspace, which has its northern border in the middle of the Mediterranean, the airline said, one of the planet’s busiest air corridors connecting Europe and the Middle East. Special teams from the Egyptian Armed Forces were are at site located for inspection and rescue. Watching playback at 00:37 (utc) there looks to be a conflict between this aircraft and UAE194 which cross both ostensibly travelling at FL 370 however looking at the speed/alt nothing appears to happen suddenly at that point. 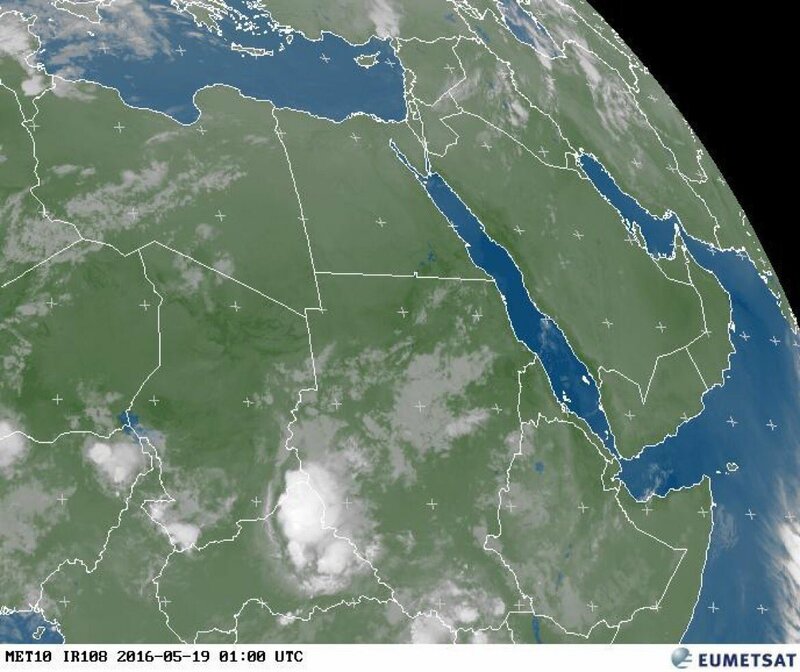 It disappears roughly 19 minutes later over Kafr El-Zayat, despite the BBC stating it's feared to be 'in the sea'. The flight is not actually being tracked, on playback flightradar assumes that after loss of contact flights will continue in their present direction. @susier. There are some decidedly bizarre features of the playback, including UAE194 disappearing from it - though zooming in, there appears to be no 'conflict' at all. As a regular FR24 user, I'd say that despite a previous comment, ADS-B coverage in the area is glitchy and can't be relied upon. Isn't there a US carrier battle group loitering in the Eastern Med these days? Unfortunately, no. The USS Truman is on Middle East duty, but it's currently in the Persian Gulf and not the Med. This explanation is also incorrect. Think of surveillance in two ways, cooperative (the aircraft tells you something) and non-cooperative (you are not dependent on the aircraft telling you). ATC radar is (for safety reasons) non cooperative using either primary radar (a skin paint) or secondary radar where more than one radar detects the signal from the transponder. ADS B is a cooperative technology, the aircraft's transponder squits out the position of the aircraft and that gets picked up by a ground receiver, which is why you can do it on your home PC for a few bucks spent on an aerial. Very few ATC units utilise ADS B only. ADS B has benefits in the amount of data which gets sent, like Mode S aircraft ID, the tail number and callsign. No need for a squawk code but not all aircraft are equipped with ADS B and you, on the ground, cannot be certain that what the aircraft is telling you (position reporting) is absolutely correct. Whilst flight radar 24 etc is an interesting toy to check on the status of where auntie Doris aeroplane is when she is coming to visit it is not what ATC (in general) are using to track aircraft. I was referring to an altitude conflict as in both aircraft travelling at 37000 ft and crossing paths. It looks as though FR can't be relied on in any case; as quite rightly stated other flights appear to vanish and to be in entirely the wrong place at various points also. Apologies for the waste of time. The LKP is about 300 kilometres distant from all land, being Turkey, Egypt & Greece (Crete). It is just on the very edge of useful range for FR receivers, so it is not surprising that data is not reliable. There is nothing to learn from the FR track except that everything appeared normal until LKP, anything more pure speculation. What are the bounds of "Egyptian airspace"? How far offshore?